Early Booking -10% for bookings until 30 December 2018. Prices shown are for Ekaterini Vip Villa per day in Euros with a minimum stay of 7 days. Air-condition, wireless internet, linen, towels and cleaning every 3/4 days (twice per week) are included in the above prices. 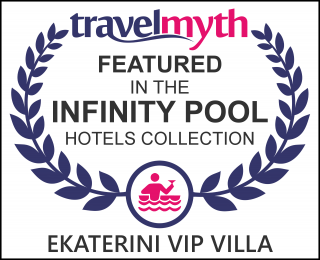 Ekaterini Vip Villa can accommodate up to 8 guests. A welcome package is offered free of charge. Central heating is provided during April with an extra cost of 30 Euros per day Conditions 30% deposit is needed to confirm your reservation. 20% deposit is needed to confirm yourreservetion. 50% of the deposit is kept in case you cancel your reservation 60 days or more before check-in. In case you cancel your reservation less than 60 days before check-in then 100% of the deposit is kept.